What makes for a perfect Sunday lunch? A little bit of adventure in trying out some place new… check. Ambience that sweeps you in, outdoor seating, quirkiness and a theme… check, check, check. 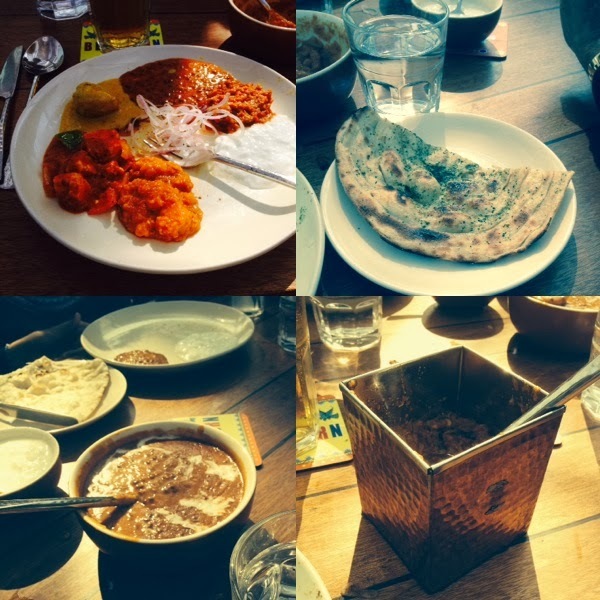 Dhaba by Claridges is a Delhi tradition. Most of us, who mind you were born with a silver spoon in our mouth, the silver being of different levels of purity, have at one time or another eaten at the Claridges’ trademark restaurant Dhaba in Delhi. The grand presence of a truck at the restaurant has been a childhood memory that fails to fade away. So, finally the folks that run the place decided to break off a small part of the restaurant, metaphorically speaking, and open up a stand alone “joint” at the newly opened Cyber Hub in Gurgaon, and that is where we ended up on this beautifully sunny and cool Sunday afternoon. Dhaba has a lot going for it, and that is besides the backing and the name its mother restaurant has given it from birth. Based on the concept of the popular roadside eating shacks that can be found along the highways of India, it gives the foodie and option to have delicious food without worrying about hygiene or driving out of the city. You obviously end up paying a price for this, but surprisingly not as much as you would imagine. So, with a number of speciality restaurants and outdoor seating that turned out to be perfect for a late winter afternoon, Cyber Hub (and by association Dhaba) has become the latest craze in Gurgaon. Families, couples, businesspersons, go on any day of the week, and you are likely to find one or the other occupying various restaurant seats and the walkways in this complex. Dhaba occupies a nice little corner in this set-up and the location which adds to the ambience is a huge plus. While the indoors of the restaurant are equally fantastic, weather permitting, grab one of the seats outdoor to take in some sun and enjoy a bit of people watching, while they in return watch you munch on some succulent Chicken Tikka. Let’s start with the basic and most important reason for the entire trip, which involved us getting out of the comforts our home and driving an astounding 10 minutes to reach the restaurant; the food. Delicious, juicy, tasty, are but a few words that could be used to describe the food; granted that it wasn’t “orgasmic” but it was still filling enough and flavoursome enough to leave everyone satisfied and happy. Serving typical North Indian food, with enough options for both vegetarians and non-vegetarians, you are bound to find most of the classic dishes on the menu. Chicken tikka, veg kababs, dal makhani, kadhai paneer, raita, alloo subzi, it’s all there and surprisingly each one equally good. The fact that the restaurant doesn’t try to fancy up these dishes and keeps them low key and true to the concept it follows adds to the charm of the place. But, life has a way of never giving you everything. It will make you work a little in some cases, and in others will remind you that everything isn’t always in your control or to your liking. 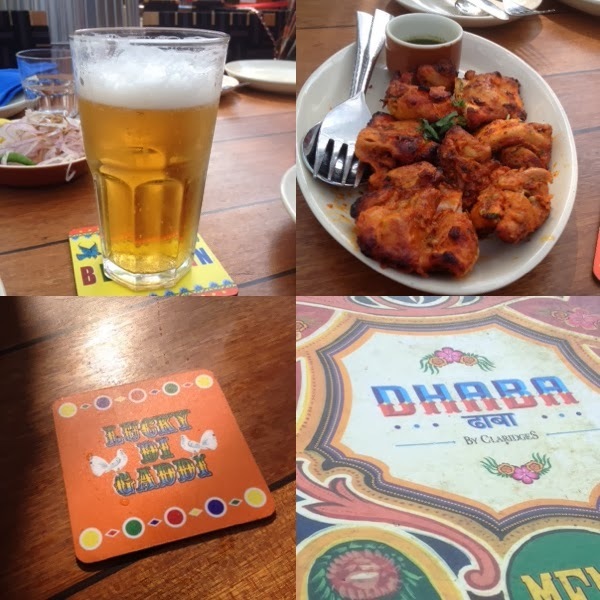 So while the weather, the ambience, the food was perfect, the service at Dhaba left a lot to be desired. I find the excuse that it was rush-hour annoying and completely unprofessional, so we will not even consider the fact that it was a busy time for them this afternoon. First and foremost I found the attitude of the service staff a bit pretentious and moody. They weren’t rude, but there wasn’t the warmth one might get at a real Dhaba or at any other reputable restaurant. We ended up asking for water, the first deed to be undertaken as soon as guests settle down, three times before our glasses were filled. This when we were there with children, myself included. Side plates were missing for two of us and were brought after two reminders as was the fork in my case. Presentation is another important aspect for any restaurant and while most of the items were served well, the yogurt was brought filled to the brim and as a result dripping and falling on the table when finally placed there. I am aware I am being extra picky and this is by no means a complaint or a statement that I disliked the place, quite the opposite, but a little bit of class can go a long way when trying to impress the person paying and that is what was missing today. 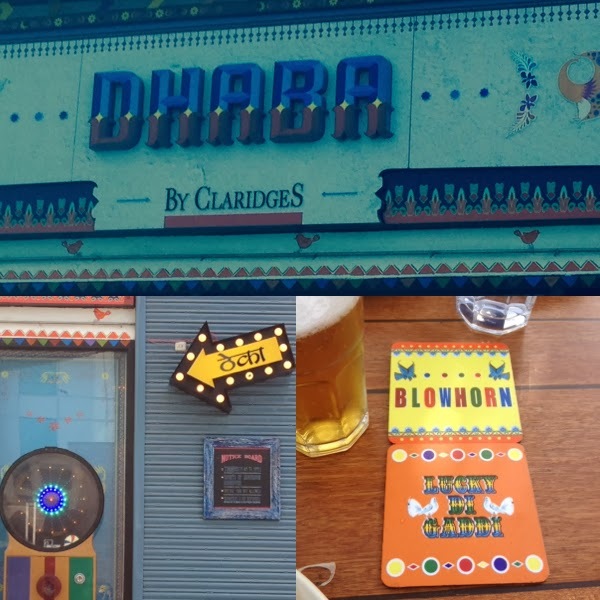 Dhaba by Claridges doesn’t really re-invent food, but what it gives you is wholesome North Indian food in a setting that is surely impressive. As for the dent on the pocket, surprisingly not much, but mind you the trick is to go in numbers because with generous helpings, your food bill will be about the same whether it’s the four of you or like in our case the eight of us. Did they have the green dal? I haven't come across too many dhabas which serve that. This isn't a conventional Dhaba, but a restaurant in a five star hotel that has opened a stand alone branch. Nevertheless, I'll have to check for it the next time because we had the Dal Makhani (Kali Dal) so I didn't really pay attention to the other options since we were in a group and everyone likes Dal Makhani. 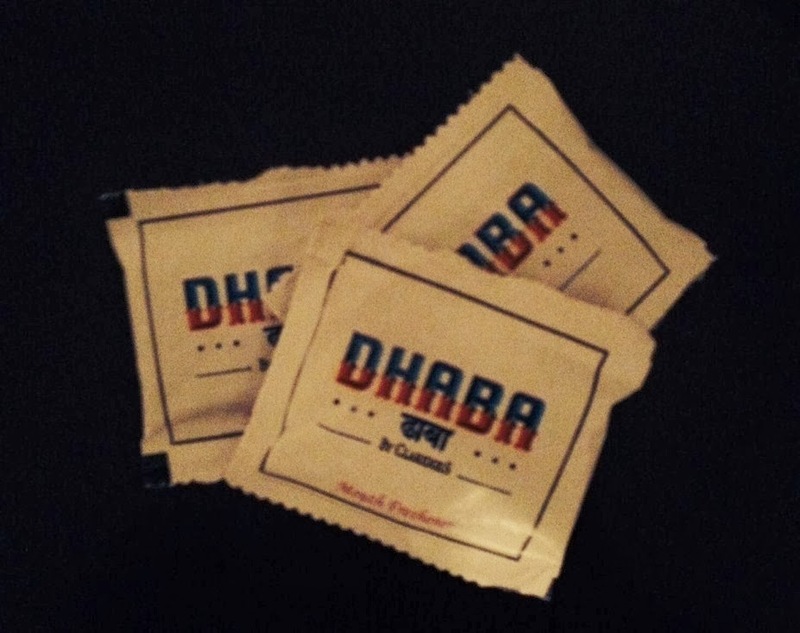 “Dhaba”…..hmmmm…..Interesting name. It’s like naming your puppy … “Dog”. Jokes apart I have heard that it’s a decent place. For while i have been wanting to visit this restaurant but never got a chance to do so. Maybe I will on my next Gurgaon visit. Thank you, Raghav for sharing this post. You can have a look that my post, this is my blog http://myjourneythroughindia.wordpress.com where I share my experiences, hobbies and thoughts. Dhaba food is always lip smacking. I like it a lot and if got some lassi or anymithi then it will be a deal. Nice.